Who Says Decorating Your Home has to Cost a King’s Ransom & Your Firstborn Child! I wanted to share some simple ideas with you, to help get you excited about your home during this new year! As a teenager, I remember a gal who would go into a very expensive department store and buy a whole room display. Then, she would comment on the “deal” that she was able to get, because she bought the whole thing! Of course it cost thousands of dollars, but to her, it was something that looked beautiful – and it was already “pulled together” for her. For some people, having the “work” done for you is a huge relief, but for some reason, I couldn’t be happy doing things this way! I think it’s because, although the end result is wonderful, for me, the creative journey of getting there is still such a thrill! For many, the cost factor of “pulling a room together” keeps them from even getting started! I’m here to tell you… that you can have a beautiful nest the same way the birds do… by going out and finding beautiful tidbits here & there… and then weaving them together into one beautiful nest! Your “I found this for only $” might be a very different price point than my “I found this for only $” price! Example: I was talking to a person who was sharing their excitement about a recent find they had made. It was a vintage pine cupboard that they “only paid $1000” for. Although that was probably a GREAT price for that particular piece, my mind was wandering back to the 2 vintage pine cupboards that I had picked up – one was $2 at a yard sale, and the other was $17 at a local auction. Also, sometimes you find great deals like the ones that I found, and other times… not so much. The point? Use what you have, and find the best deals possible. 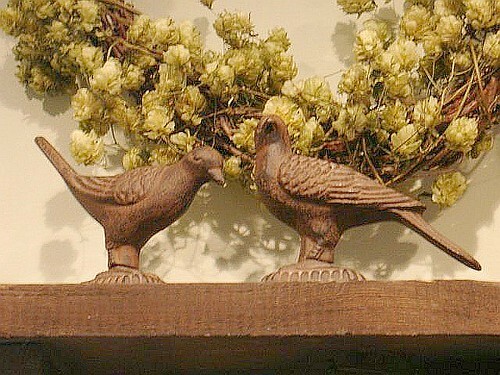 For this mantel display I brought in several elements from the cottage garden. 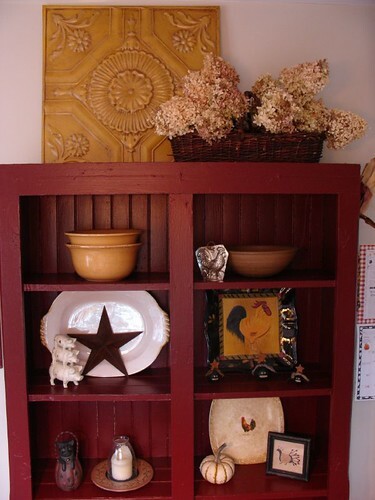 Try to have places around your home, that you can “re-decorate” very quickly & inexpensively. This is the space during the summer – but between holidays. Here’s how I changed it up this Christmas. 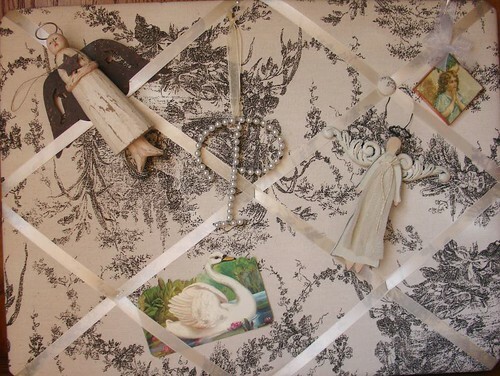 I have a box of different paper items, vintage post cards, broken pieces of jewelry, and other little bits & bobs that I can quickly pick through to change up the inspiration board. Keeping pretty little things doesn’t cost any money either! If I get a card that I like, I’ll be sure to keep the front, and write who it was from on the reverse side. Most of the time, people don’t write to much inside of cards but their name, but if they do, you could keep the whole card. I’ve been known to keep gum wrappers (especially the “5” brand – such beautiful metallic colors! 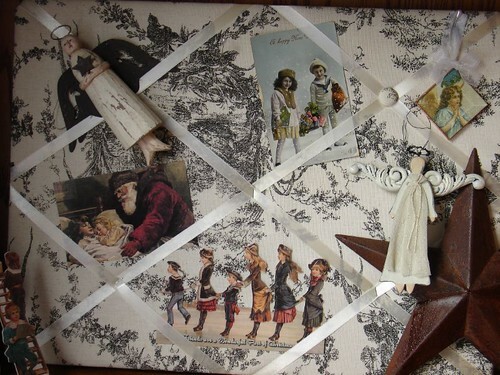 ), bits of wrapping paper, cut little pieces of calendars, etc., to use in my displays. Here is a display made of items that are mostly from the $1 store, thrift store, yard sales, and discount stores. I some of my favorite items that were similar in color & theme. This is a Spring display. Here’s a little display that YELLS Spring. 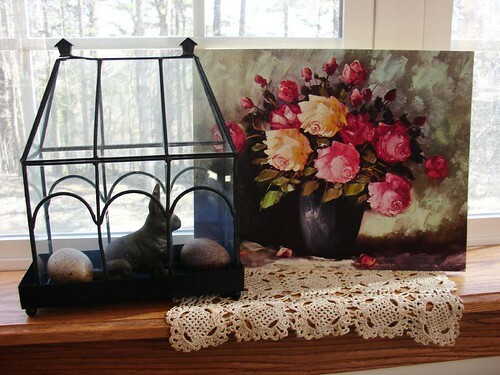 I used a little greenhouse that I picked up for a couple of dollars at “Big Lots”, an iron bunny, a few plastic eggs, a doily found in the bottom of a $1 auction box, and a picture of roses found at the thrift store for .99! 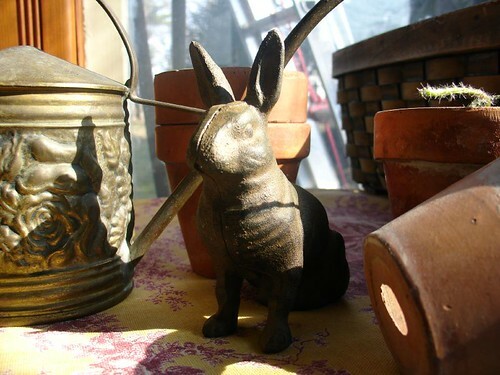 You might remember seeing the bunny’s sister in the clay pot display or in the picture above? That’s because… I’ve learned, that if you really like a piece like that and you can buy it for a reasonable price, you should probably pick up more than one. That way you can use the second one in other displays around the house. By this picture, you can see that I decided to pick up more than one iron bunny, and several eggs (they look so real!). Now I have several to sprinkle around the house in different displays, yet they all help pull the current them together. This works especially well if the two items have different poses, such as the pair of iron birds that I found for under $5. This display is a close up of one of the pictures above. 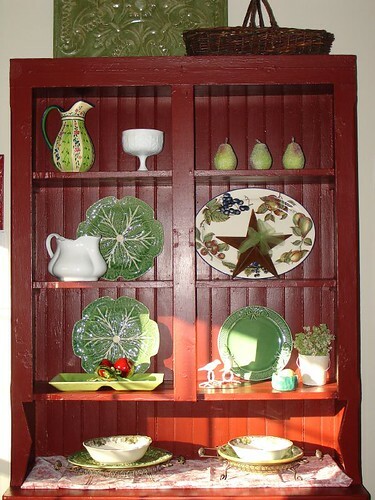 The shelf was made by my husband, from an old board taken from a wall in our previous 1856 village home when we re-built that section of the room. 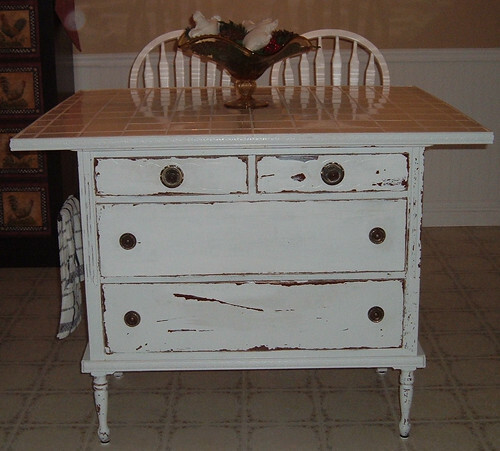 Here is a beautiful kitchen island – made from a “found” dresser, with an added tile counter top. 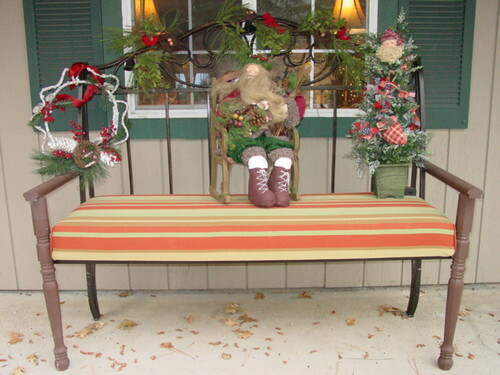 Here is a beautiful bench made by Connie over at Life at Treetop Cottage. She used an iron headboard that they no longer needed, then added the extra pieces to make this beautiful bench! 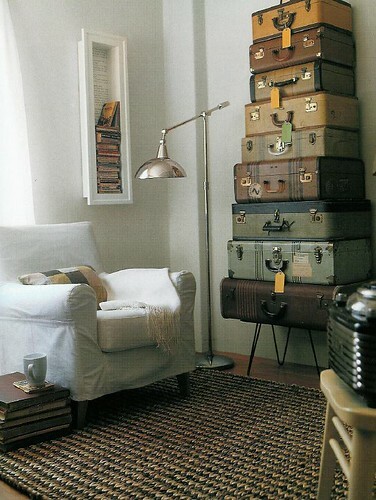 In this picture, several discarded suitcases were used as a new decoration – and new storage! Also notice the picture frame on the wall that now holds books! Look at what was done with this discarded suitcase! BEAUTIFUL! So don’t let the fear of getting started – or – the cost that others might pay keep you from pulling together beautiful rooms & displays in your home! Our readers are so creative! Please share your ideas & pictures of your “nest” in our Home & Garden Forums! Lovely ideas! Where did you get the rabbits and eggs? 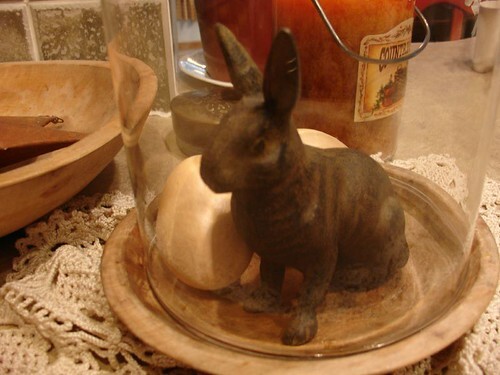 I picked up the rabbits at a local “prim” gift shop called Persnickety (one of my favorites!). I just looked on ebay & found several there to choose from. I want to live at Cracker Barrel by the fire- and such stick to your ribs food. Their gift shop has the best country accesories and even clothing! I love all your ideas. We are in the process of building a home and I can’t wait to begin decorating. Your site inspires me to go “find” some treasures. I know what you’re feeling like right now – as I was in your shoes 2 years ago! But… I didn’t let it stop me from getting ready to decorate! Each time I found something that I thought would be nice in our new home, I simply packed it away into plastic tubs. I can’t express how EXCITING it was to unpack everything & start putting it together! And now that I have different containers filled with items for each season – I get to feel the same way each time I go through a “re-do” of a room! love it all! Thanks for sharing! Wonderful post! Exactly how I love to decorate! I am not swimming in money so it is a necessity as well as a love! LOVE the photos and ideas…it truly does not take cash as much as imagination. _____ would look good over by _____? He knows he is about to do some more moving!! LOVE the post! Your home is heavenly! Great ideas! Beautiful pictures! And, tons of inspiration! This is the first time to your site. I just LOVE your ideas. They are very practical yet also creative. I have just started out renovating my home and I like your idea about thinking about areas in your home that you can change frequently. I think it is also important to think about wall colour, in general. In my experience, it is much easier to change the seasons if wall colour is neutral enough that it will “go” with summer decor as much as “winter” decor. I agree with you about the wall color. But, don’t allow it to get you “hung up” on exactly matching everything. 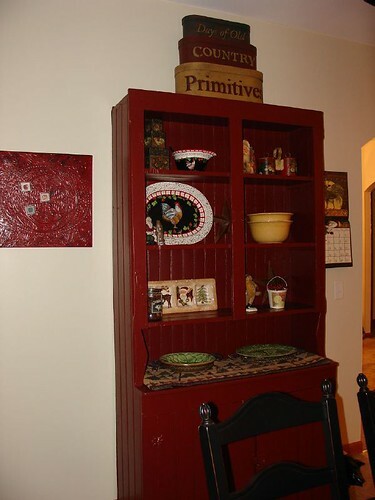 An example would be my red cabinet in the dining room. I have some red items in the cabinet (during Christmas) that don’t exactly match the same shade of red as the cabinet… but… it all seems to work together. A terrific post! I was wondering how things would look after your gorgeous Christmas decor came down for the new year! Thank you for the wonderful ideas and the fantastic photos- I personally enjoy how your vignettes and displays never look cluttered- they don’t overwhelm the eye. Thankfully they’re not sterile either- the mixture of textures, colors and materials just keep everything so interesting! Thanks for all of your kind words! I am absolutely amazed at your creativity! How blessed you are! I’ve been receiving your newsletter for several months, but I’ve had lots going on–one of those dismal periods we all experience–and this morning is the first time I took time to read it and visit your site! I am SO glad I did. I have to tell you that I’ve even received career help from you. I am an eBay seller of vintage goods–and basically anything upon which I can make a profit (by necessity)–and you’ve opened my eyes to some things I may come across at estate sales, etc., that I might have otherwise overlooked. I’ve made some interesting purchases over the past couple of years (and have an inventory of about 3,000 of my “finds” just begging me to find time to ist them), but I believe my consciousness has been raised anew on the inspiration I’ve found here. Thanks for sharing your gifts! Thank you for taking the time to share! I love hearing good news such as what you’ve shared with us! Beautiful, beautiful ideas. Thank you for sharing. I’m going to go try a few out already since I’ve painted two accent walls and I’m now adding a few new touches. Thanks for the inspiration! I have been reading your blog for months now, and have been delighted that I found it!!! Your ideas are very creative, and your home looks so welcoming, comforting, and cozy. May I ask you, where did you obtain the angel with the trumpet shown in the picture of your little cottage office? The whole room just invites you to come in and relax!!! I have always loved angels and have never seen one like this. Thank you sincerely for all of the time and energy you put into this blog, and for sharing your home and ideas with all of us. First of all – thanks bunches for your kind words! I picked up the angel at a local garden/gift shop. 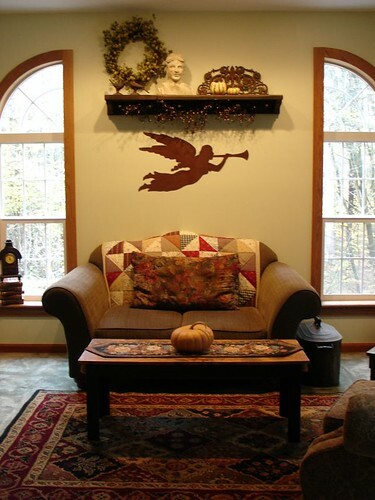 They carry lots of different kinds of items – including large barn stars & the angel like mine. I’m not sure if they have any left – but I could look. I know it was under $25. This is my first visit here and I really like your decorating ideas. My husband and I were just discussing how to cozy up our large living room and you have given me some inspirations–thank you. Great post! Loved all the ideas! 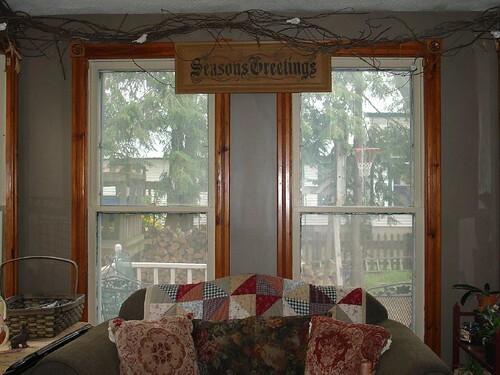 I have one shelf in my living room that’s just for display so I can change it out seasonally or when the mood strikes. 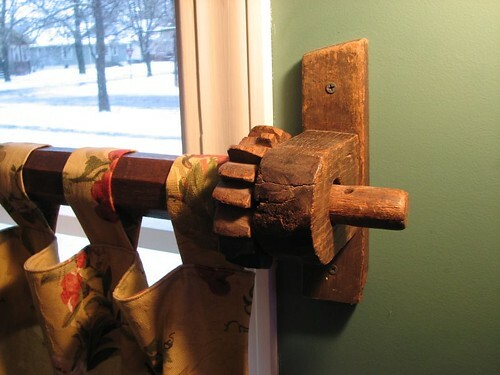 I think that’s a great idea to have specific places in your home that you can do a quick change. Thanks for sharing your great ideas! 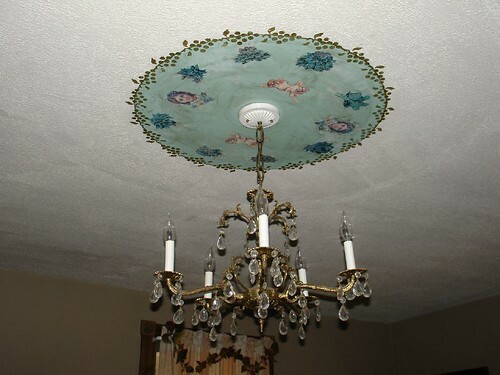 I love your ceiling medallion. You have so many original ideas — I’ve been an avid reader of decorating magazines for over 30 years and rarely see anything new anymore. You very creatively! I use some your ideas in my home. I am new to this site and love everthing I have seen so far and have not even had time to look through all the posts. what beautiful photos and decorating. I am listing your site on my blog tonight!! It is always such a pleasure to visit your blog and see your wonderful ideas. You certainly are a girl after my own heart! I especially love the idea of using an old dresser for an island…so clever! There are so many wonderful treasures out there if we just take the time to look. Great post! I so agree with you, and its so much fun decorating with things you made,reused,inherited or found somwhere than just buying something new. In my house the things I love most are the things with history. Great ideas, and great pictures! Love your blog! I Love what you did around the chandelier on the ceiling, oh my goodness, just absolutely fabulous!!!! I too am about finding a bargain, even if I have the money, I am on the hunt for a good bargain, makes those goodies that much better! Thanks for the lovely tour! While painting I used the wrong tape on a humid day an pulled off the ceiling paint… Oops! I know..
Again, all of these are great ideas! Ohhh how did I miss the suitcases! I LOVE vintage cases!!!!!!!!!!!! How delightful and creative! I’m so pleased I found this site. The bench made from an old headboard is just beautiful, simple and sturdy and inviting. 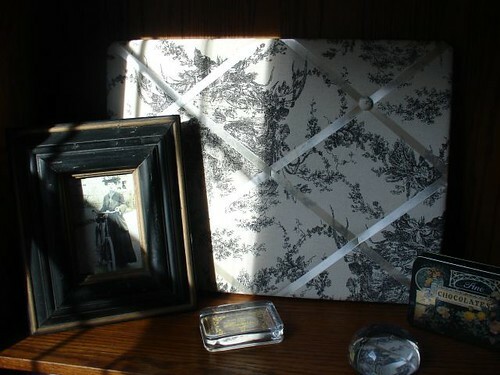 After seeing these ideas, I now know what to do with the leftover toile I have in my sewing basket! Just came across your site and thought this is for me, I am doing up my daughters unit on a small budget as she is getting married and she wants a fresh look for when they return from their honeymoon. So I am hoping I will get many new idea’s from you. I am looking at a paris theme. 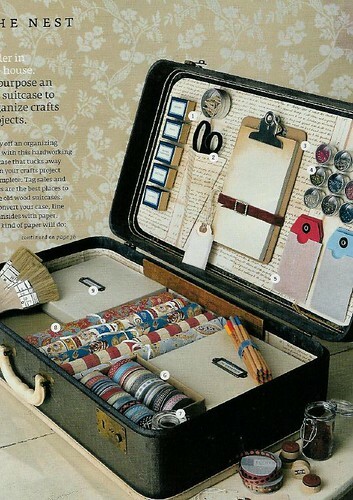 I loved the the suit cases it gave me a idea for my sewing. Or storing quilts. Keep the creativity coming. I like the creative ideas for my bedroom…. for i it look perfect and cool…. I have been living in a small two bedroom apartment for two years and decorated it up cute. I previously lived in a 3 bedroom house and everything has been in storage. I am getting married in September and moving into my guys 4 bedroom house after the wedding. I am so excited to get moved and unpack my treasures. I am sure I have forgotten about much of it. So it will be like christmas! Any suggestions for making an open living room kitchen flow with color and design? I am going to use the suitcse idea as I have many. Also, I like the idea of creating a shelf or hutch, table and just change up the nic nac’s. Thanks! Now i’m very inspried with the article, and it’s unusual to discover such a good site. Greetings, You craft some excellent blogs, I adore nearly all your article content. I always check back here often. Continue blogging!